UNITED NATIONS — At Russia's request, the UN Security Council met Sunday for an emergency session to cool escalating tensions on the Korean Peninsula that Moscow's UN ambassador warned affected his country's national security interests. The session, which started at 11 a.m. New York time, or 7 p.m. Moscow time, was called by Ambassador Vitaly Churkin in response to South Korean plans to stage live-fire drills by its marines on Monday off the small island of Yeonpyeong, prompting North Korea to threaten stronger retaliation than last month's bombardment on the island that killed four people. "We are seriously concerned about possible further escalation of tensions on the Korean Peninsula," Churkin told reporters Saturday, adding that the situation "directly affects the national security interests of the Russian Federation." He said Sunday's session of the Security Council should send a signal to both Koreas that political and diplomatic activities were the only solution. "We believe that the Security Council must send a restraining signal to the Republic of Korea and DPRK [North] and help launch diplomatic activity with a view to resolving all issues of dispute between the two Korean sides by political and diplomatic means," he said. But Churkin complained that United States, which holds the rotating presidency of the Security Council this month, declined to convene a meeting on Saturday as he had requested in a letter to the U.S. mission. "We regret that," he said. "We believe that such a step by the president [of the council] is a departure from the practice existing in the council." Mark Kornblau, spokesman for the U.S. mission to the United Nations, said other members of the 15-nation council wanted more time so they could get instructions from home, which was why Washington decided to convene the meeting on Sunday morning. The United States supports South Korea's decision to hold the exercises, and its envoy Bill Richardson urged the North to allow them during a weekend visit. On Saturday, the North's state media launched a blistering assault on the South's pledge to cooperate with the United States and retaliate in the event of another bombardment. They suggested that any such move could trigger a nuclear conflict. "It is a suicidal move akin to digging one's own grave for the South's conservative forces to gang up with outside elements to try to harm compatriots," the official publication of the North's cabinet, Minju Joson, said in an editorial. In Pyongyang, Richardson, on a private mission to cool tensions, told CNN in a telephone interview: "There's enormous potential for miscalculation." He added: "I'm urging [on the North] extreme restraint. … Let's cool things down." Chinese Foreign Minister Yang Jiechi told his Russian counterpart, Sergei Lavrov, by telephone that both Koreas should refrain from acts that would inflame an already "extremely precarious" situation," the Chinese Foreign Ministry said on its web site. 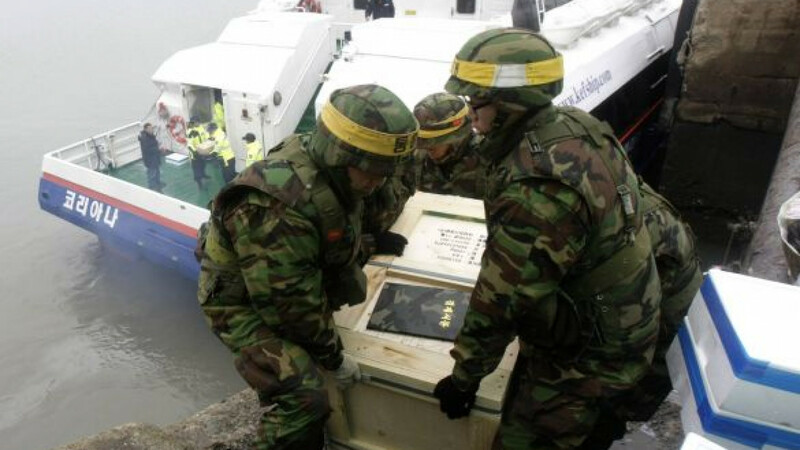 "The situation on the peninsula remains tense, and there's a risk of further deterioration and escalation," it said. China is the North's main backer and its most steadfast defender on the Security Council.